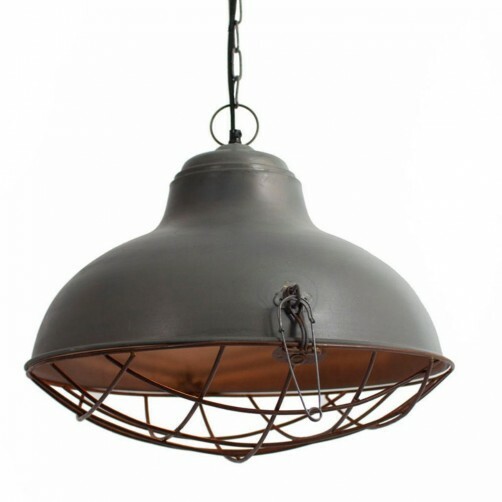 A durable metal warehouse pendant, featuring a raw metal finish and is fitted with a rustic wire cage dome. Can be plugged in or professionally hard-wired. 19" Diameter x 19"H. Max Watts: 40. 72-inches of both black cloth and silver cord reinforcements. Info: Ships out within 2 weeks, direct from our artisan to you. Ships via:Small items ship via US Postal Service or UPS Ground, larger items and furniture ship by Standard Freight Delivery. Expedited delivery is not available for this item.